Dill was known as a medicinal herb to the ancient Greeks and Romans and was mentioned in Egyptian writings some 5000 years ago. It is native to southern Russia, western Africa, and the Mediterranean region. It is the most important culinary herb in Scandinavia, as popular as parsley is in other parts of the world. Digestion and appetite are stimulated by dill’s delicious slightly aniseed taste. The leaves or dill weed is a key ingredient in Greek cooking, Scandinavian gravlax (salt-cured salmon) and Ukrainian borscht (beet soup). It enhances most fish dishes and complements rice, lamb, potatoes and pickles. The seeds, used whole or ground, adds zest to meats, sauces, salad dressing, cheese, and bread. With its feathery foliage, dill is a beautiful addition to a mixed bed or border. It is known to attract bees, butterflies, beneficial insects and birds to the garden. It grows well in containers or as patches in an herb garden. Dill grows in full sun with some shelter from the wind. The soil should be well draining, moist and moderately rich. 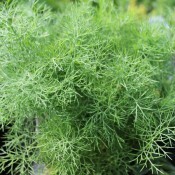 Dill is an excellent companion plant to the cabbage family, corn, cucumbers, and lettuce. 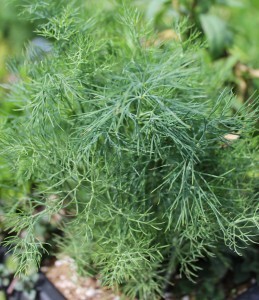 Do not grow dill next to fennel because they will cross pollinate and the seeds of both plants will lose their own unique flavours. Furthermore, do not grow dill with tomatoes or carrots since it attracts tomato hornworms and stunts carrot growth. Dill seed is a very good source of calcium. It is also a good source of dietary fiber, manganese and iron. The best way to use dill is fresh from the garden, so cut it as you need it. If not kept cut, your dill will go to seed, so cut often until you are ready to switch to seed production. Once seedheads begin to form, stop cutting dill for fresh use. Allow the seedheads to develop and dry completely, and then cut them. Remove the seeds easily with your fingers. Fresh dill can be kept in the refrigerator for about 2 days, either wrapped in a damp paper towel or with its stems placed in a container of water. Dill can be dried easily in the microwave. Spread the dill in a single layer on a paper towel and microwave on high until dry (approximately 3 minutes). After microwaving, remove and discard the hard stems, crumble the leaves, and store in an airtight container protected from light. Dill can be frozen, either whole or chopped, in an airtight container. Dried dill seed can be kept indefinitely when stored in an airtight container in a cool, dry, and dark place. Annual. Dwarf, dark green and fine-leaved, Fernleaf Dill is an excellent staple in any herb garden. It is suitable for kitchen gardens or containers and can be harvested starting at about 6 inches (15cm) in height. Delicious in fish, seafood and potato dishes. A past All American Selection Winner.